A glorious gaggle of writers! 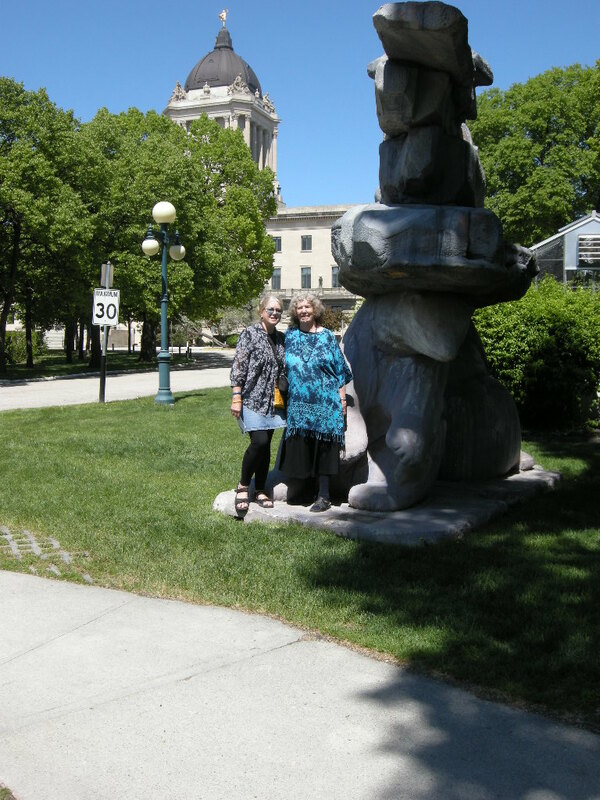 We’re in Winnipeg for the 2015 joint conference presented by the League of Canadian Poets and the Writers Union of Canada. 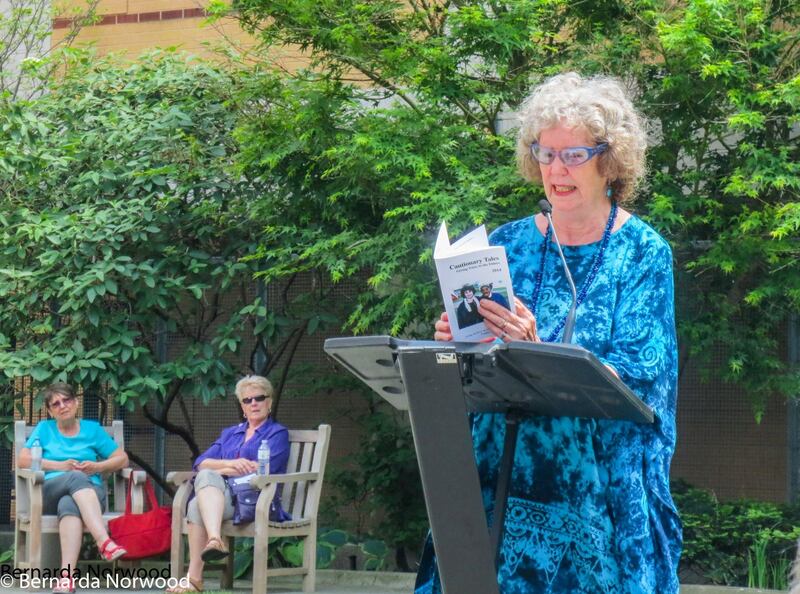 This celebration marked the 49th annual LCP Poetry Conference and Festival. So many good panels and talks and collective catching up. May 29. 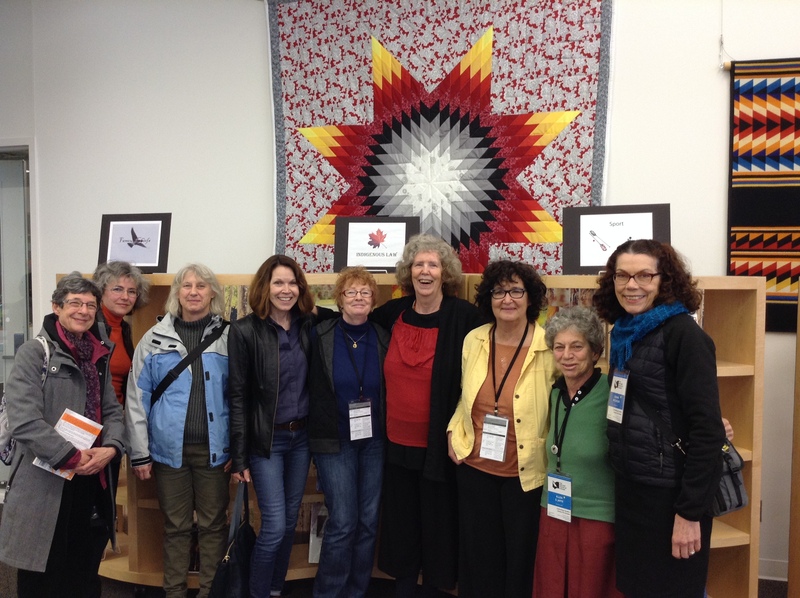 A photo after my reading… and participatory sounding.. in The Aboriginal Resources section of The Winnipeg Public Library. The reading was sponsored by the League of Canadian Poets, the Library and CV2..Here’s the poster: ReadingWinnipeg. May 30. 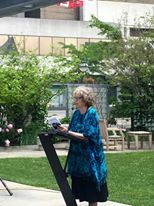 For the Feminist Caucus of the League of Canadian Poets, I read my poem dedicated to Colleen Thibaudeau. 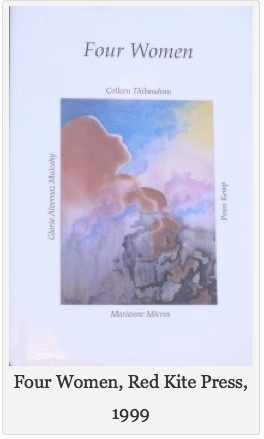 The text is up on https://pennkemp.wordpress.com/2015/06/06/poem-for-poet-colleen-thibaudeau/. 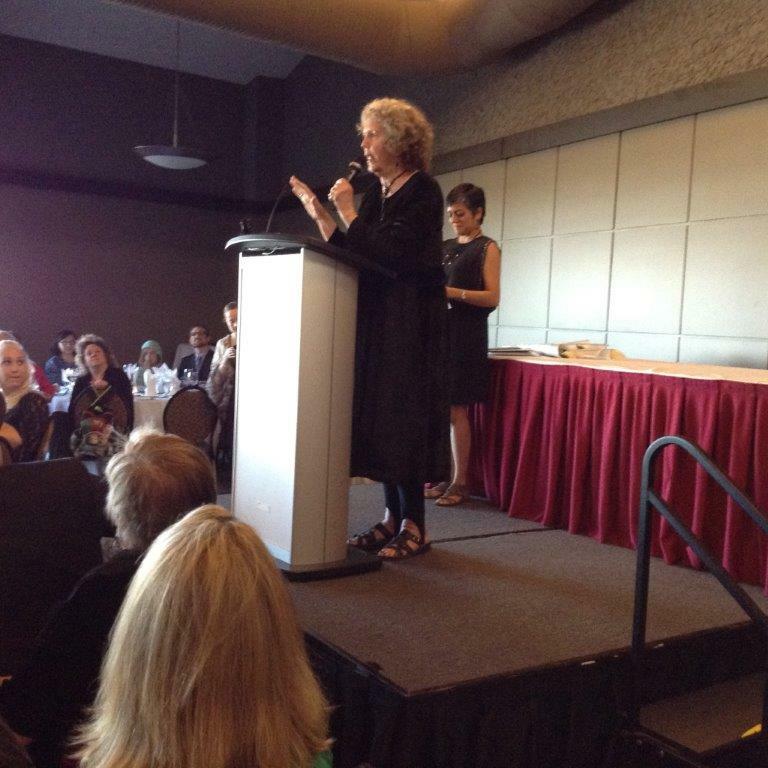 I was delighted and honoured to present the Colleen Thibaudeau Outstanding Contribution Award award at the League of Canadian Poets banquet in Winnipeg on May 30 to esteemed Saskatchewan poet Glen Sorestad, represented by Tracy Hamon. 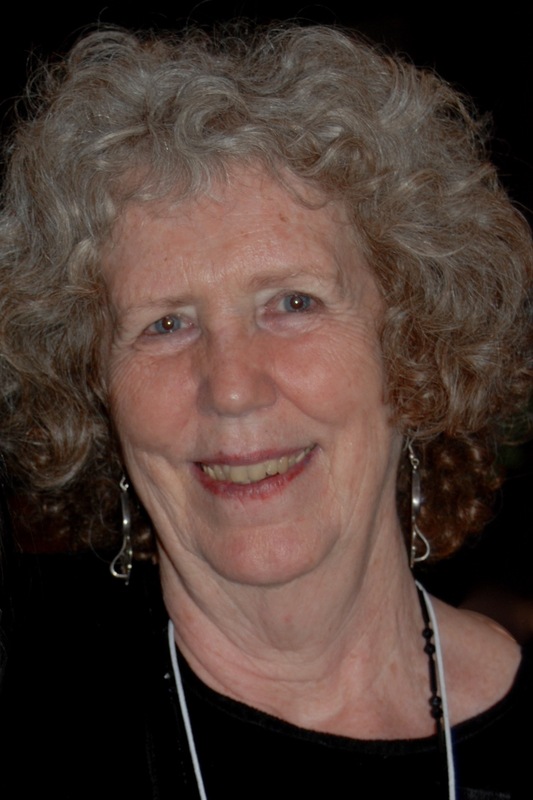 James Reaney recently wrote about Colleen and Glen Sorestad in his blog: http://blogs.canoe.com/brandnewblog/entertainment/glen-sorestad-wins-2015-colleen-thibaudeau-award-yay/. 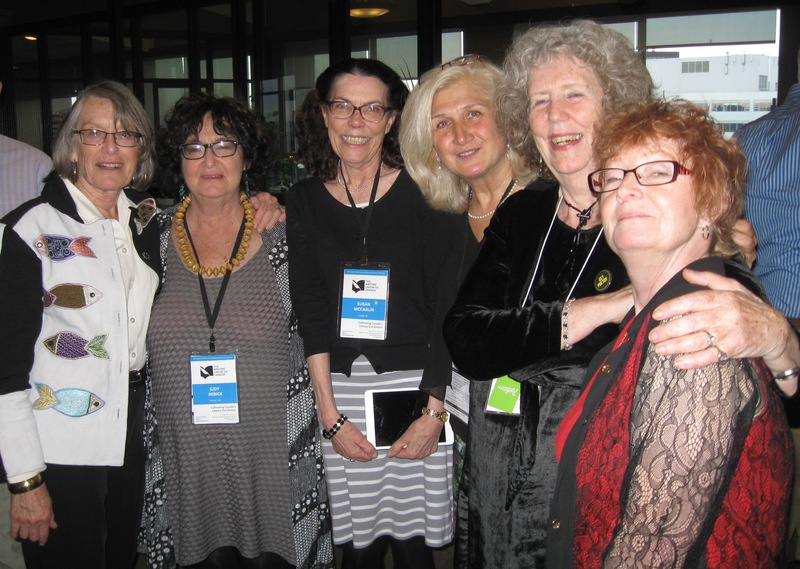 There was a large turn-out, as the League event was combined with the Writers’ Union AGM. Colleen would have chuckled at the orange flower I wore in my hair for her! 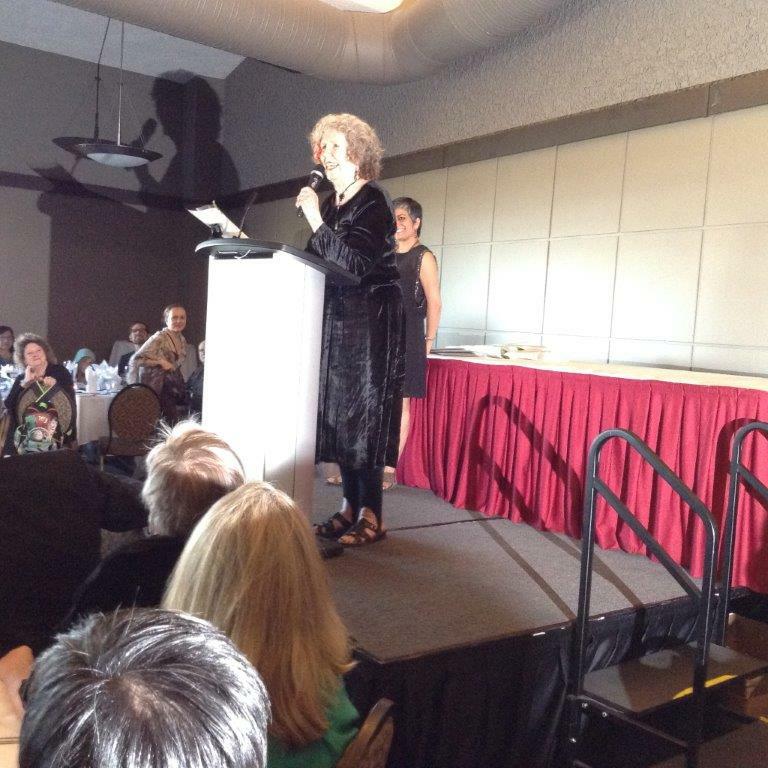 And I was awarded the 2015 SHERI-D WILSON GOLDEN BERET AWARD. Accepting Golden Beret award from Ayesha Chatterjee, President of the League of Canadian Poets. I’m describing Sheri=D Wilson as Poet Lariat! The above photos were taken by Susan McCaslin. May 31. Glad to be Carmelo Militano’s guest from 4:30-5pm on CKUW, University of Winnipeg Radio! Synchronicities abound. You can hear the half hour on https://ckuw.ca/128/20150531.16.30-17.00.mp3. 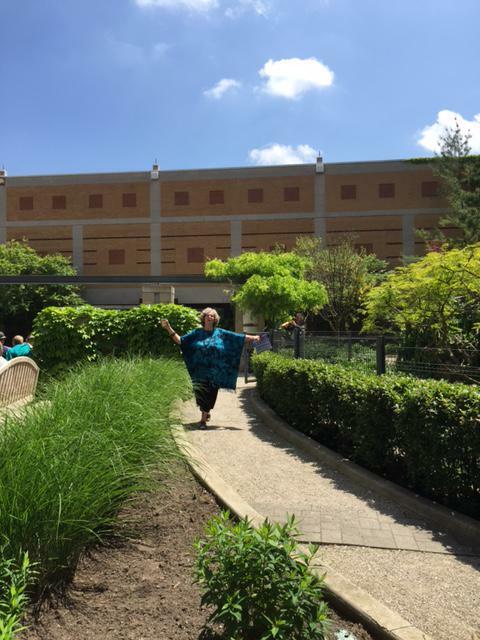 Mora Gregg and I walked this lovely labyrinth dedicated to Carol Shields. In the Manitoba legislature building, I got to sound the echo in the round Egyptian room. Sphinxes, Athena, Medusa, bronze buffalo bulls… and golden Hermes on top, pointing a way along the avenue to open the North! Mysteries abound… along with giant polar bears. Heidi, Penn and Golden Boy, aka Hermes! And THEN, the WAG. The Winnipeg Art Gallery featured an exhibit of Classical Art… including the Muses. Judy Rebick, several friends and I spend the evening looking out on the gardens where two more labyrinths are being dreamed into existence. Thank you, Winnipeg, for your kind and generous hospitality… and for bringing back the Spring! Recurring Dream Theme, Reflecting Mimesis by Penn Kemp. 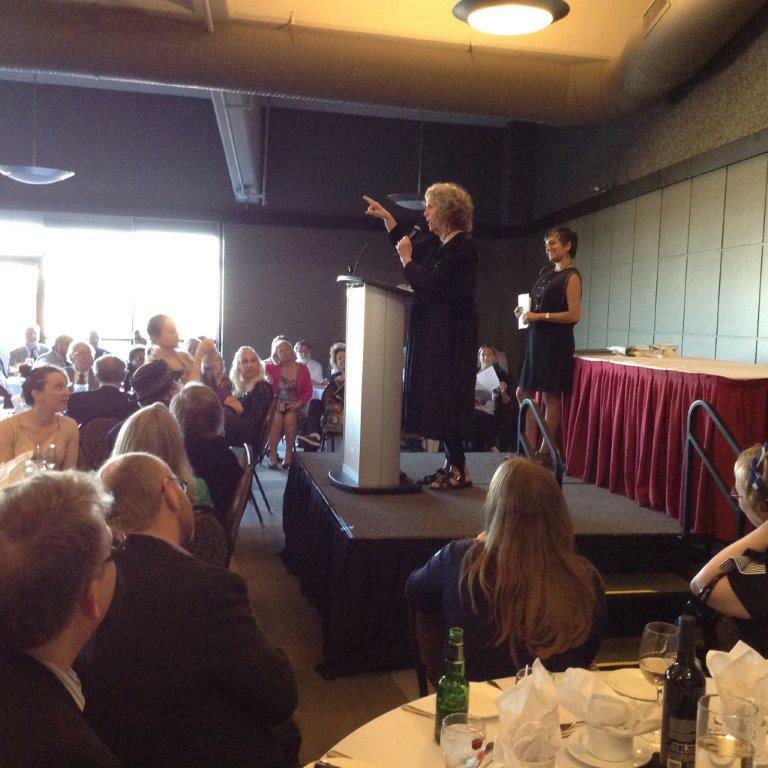 The Reaneys asked me to present the Colleen Thibaudeau Outstanding Contribution Award award at the League of Canadian Poets banquet in Winnipeg on May 30, 2015. 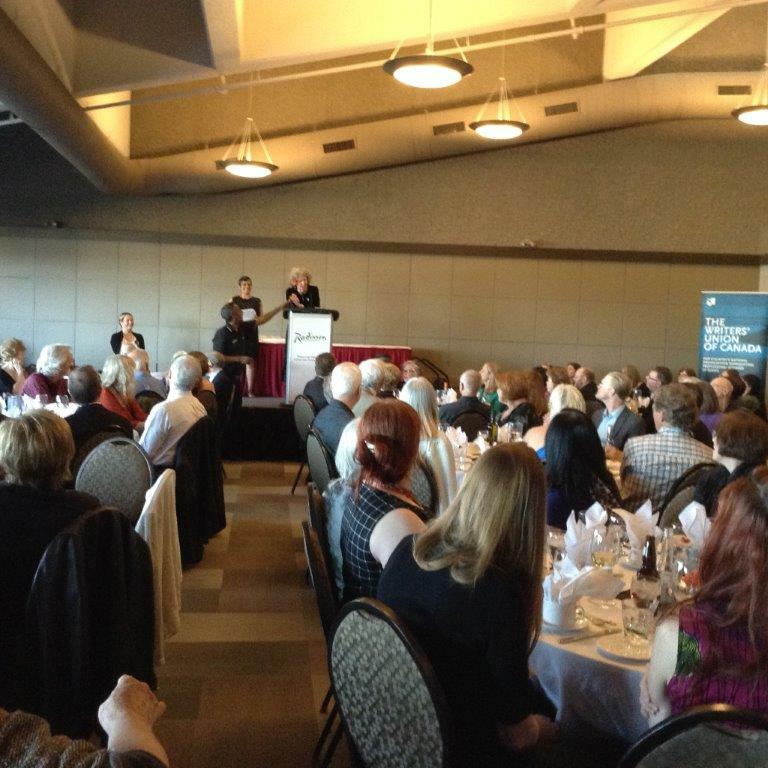 I was delighted and honoured to present it to esteemed Saskatchewan poet Glen Sorestad, represented by Tracy Hamon. James Reaney recently wrote about Colleen and Glen Sorestad in his blog: http://blogs.canoe.com/brandnewblog/entertainment/glen-sorestad-wins-2015-colleen-thibaudeau-award-yay/. as if we were on a Grey County party line in a snow storm. She invited you to dance with words; her card was full. Droll, a wit not acerbic but trolling for pertinent phrase. not settled but including errant sound, all probable puns. the sun, a sequence as consequential as spoken history. brushing hair away. More to tell from inexhaustible well. leading you through her long alliterative spring garden. the story revealed itself so far, the scene laid out clearly. reclaiming the smoke of ancestral aeons, and be welcomed. The cover of Four Women, Red Kite Press, Guelph ON. 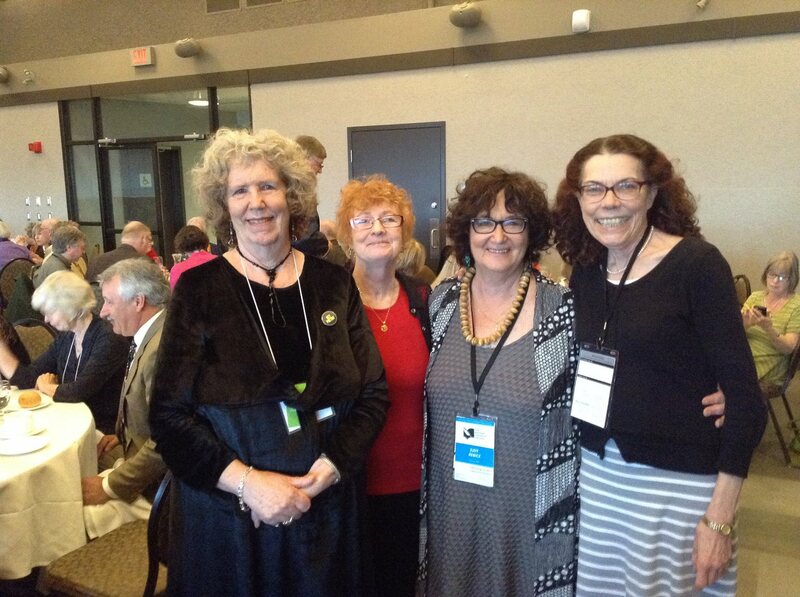 Colleen and I are both in FOUR WOMEN, along with Marianne Micros and Gloria Mulcahy. 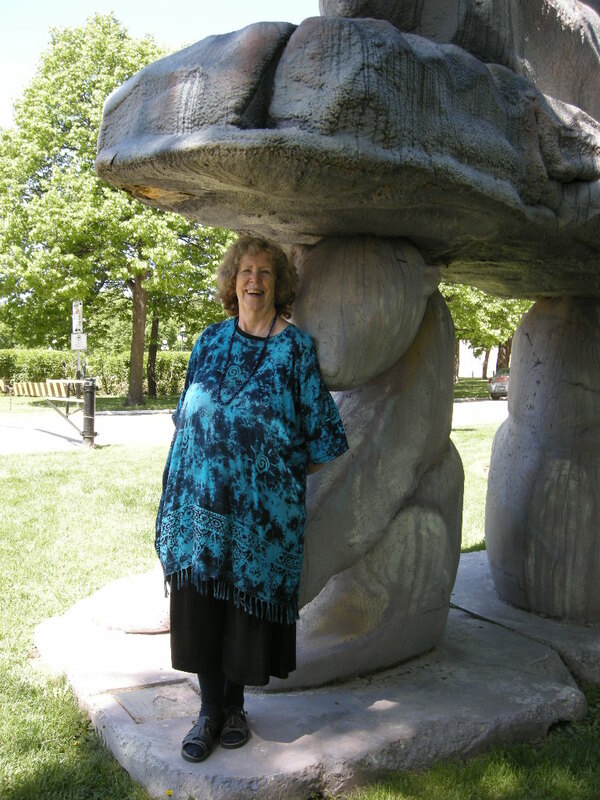 You can read more about Colleen and her poetry on http://colleenthibaudeau.com/, including a reading from FOUR WOMEN celebrating her. 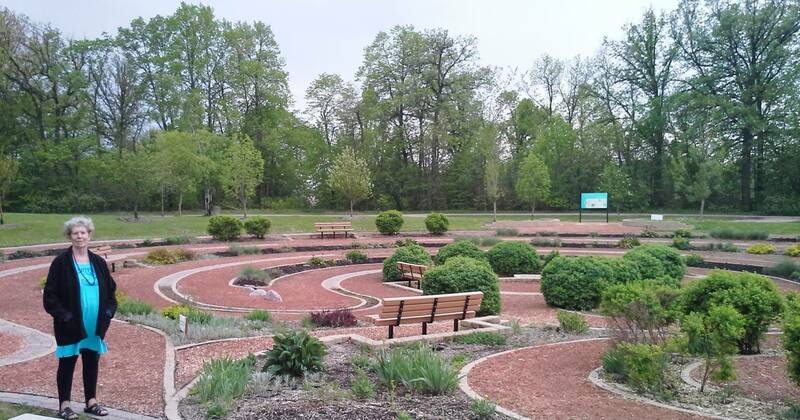 I thought of Colleen when walking the labyrinth dedicated to Carol Shield. It was lilac season still…and I thought of Colleen’s lovely spring garden. Photo by Mora Gregg. 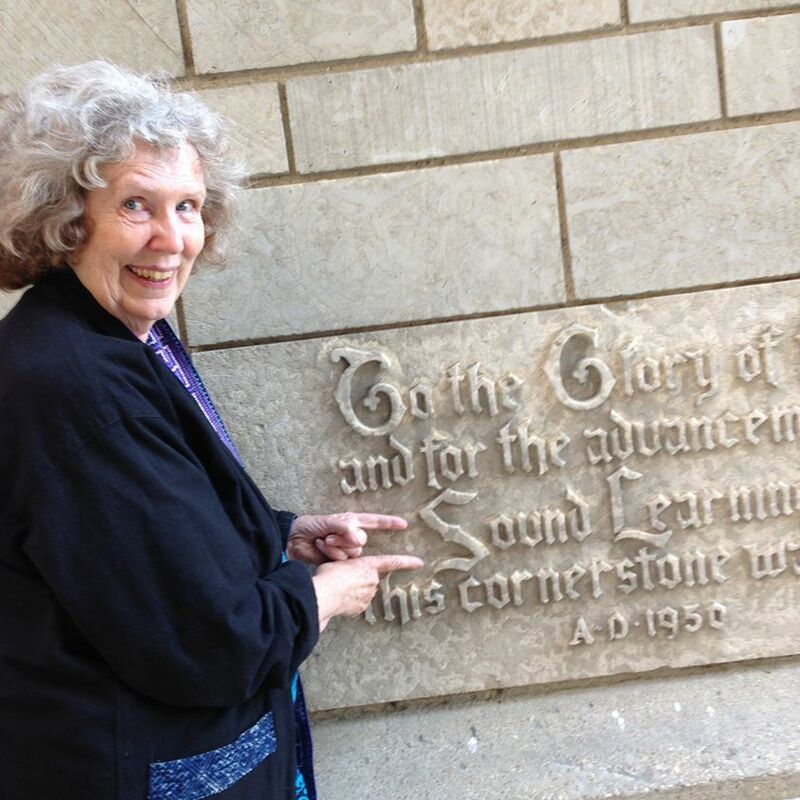 I know Colleen would also have enjoyed this found poem for Sound Learning on a University of Manitoba stone wall.